A new research group aims to make a big dent in the backlog of astronomical data currently sitting in online archives around the world, just waiting to be analyzed. The group — which is known as Astroinformatics and is based at the Heidelberg Institute for Theoretical Studies (HITS) in Germany — hopes to develop methods that will make searching huge and ever-growing astronomical databases easier and more intuitive. "The amount of data increases exponentially," group leader Kai Polsterer said in a statement. "The number of astronomers does not." Improvements in computers and increasingly advanced telescopes have allowed scientists to gather a wealth of data about the universe around us. 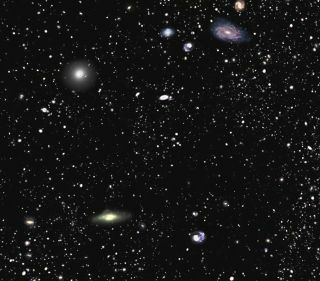 For example, large-scale efforts such as the Sloan Digital Sky Survey chart hundreds of thousands of celestial objects, creating maps that are available to scientists around the world via online archives. Astroinformatics hopes to make sorting through this massive influx of information easier. The program will automatically calculate features about a celestial object from the data, such as its redshift — a measure of how much the expansion of space has stretched an object's light to longer wavelengths, which in turn can reveal its distance. Astronomers studying objects in a specific range could then use the program to identify the bodies more quickly. "We focus on using new approaches to support observing scientists with their research," Polsterer said. The group will also seek to increase the popularity of machine-learning approaches in astronomy. "There are many treasure chests full of data to be unearthed," Polsterer said.